This private tour in Spain is designed especially for those who are eager to explore the main sites of Palna de Majorca in the shortest period of time. If you are pressed by time and you don’t have a couple of additional free days at your disposal, we can work out the best possible itinerary in order to manage to see the most popular tourist destinations and places of interest in the main city of the Majorca island – Palma de Majorca. It is worth noting that you will be provided with a private transport, and it may be a car, bus or even a helicopter, if you are really in a hurry. A private means of transport will allow you to explore all the most intriguing attractions of Majorca and spend less time. On the contrary you will save your time for exploring some other places, instead of wasting it for travelling from one historical monument to another. 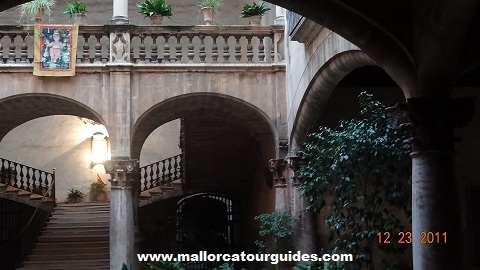 Your private guide in Palma de Majorca will assist you during the tour and show you the most interesting places on the island. You should take into consideration that the entrance fee in not included in the initial price of the tour. The itinerary is flexible and together with your private guide in Spain you can work out the most interesting tour personally for you. Here are some places for consideration: La Lonja de la Seda is one of the best preserved model of late Gotic architecture, so if you are interested in history and architecture, you would definitely enjoy exploring that marvelous edifice; The Royal palace of La Almudaina is another famous landmark of Palma. Initially it was built to serve in the capacity of an Arab Fort, but soon it was claimed to be an official royal residence. By the way it is still in use, as far as it happens to be the official summer residence of the members of the royal family. The Cathedra of Santa Maria of Palma is a remarkable building preserved from the Medieval Times. It is worth noting that the construction of the cathedral lasted for almost four centuries! Just want to thank you for a work well done today. I had a great time, learnt a lot and I think I got the highlights of Mallorca. I especially enjoyed the tout in the cathedral. Trust me, I am not a atheist, I have just spent too much time in churches on guided tours with guides explaining the religious blablabla on... You kept it to the minimum and you made it interesting.